This week is Spirit Week at school and my friend, Nikki, decided we needed muffin hats for M Day. 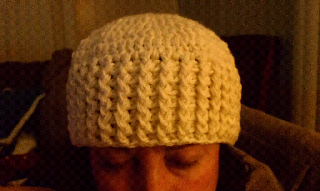 Working with an idea, I created this hat. I'm working on a pattern to share. It's a pretty great hat and super comfy. I hope Nikki has fun adding the "blueberries."